iHear 2014 from UBIQ on Vimeo. 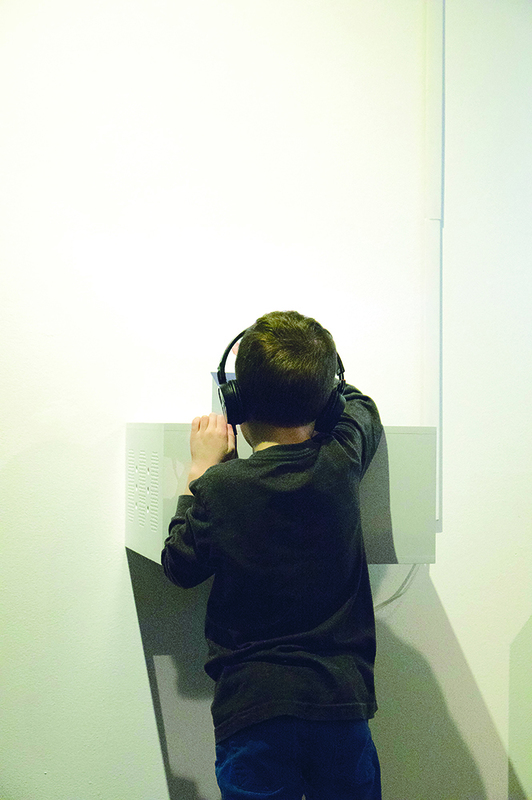 iHear is an interactive instrument, designed for the gallery, that emits four popular cell phone ringtones. 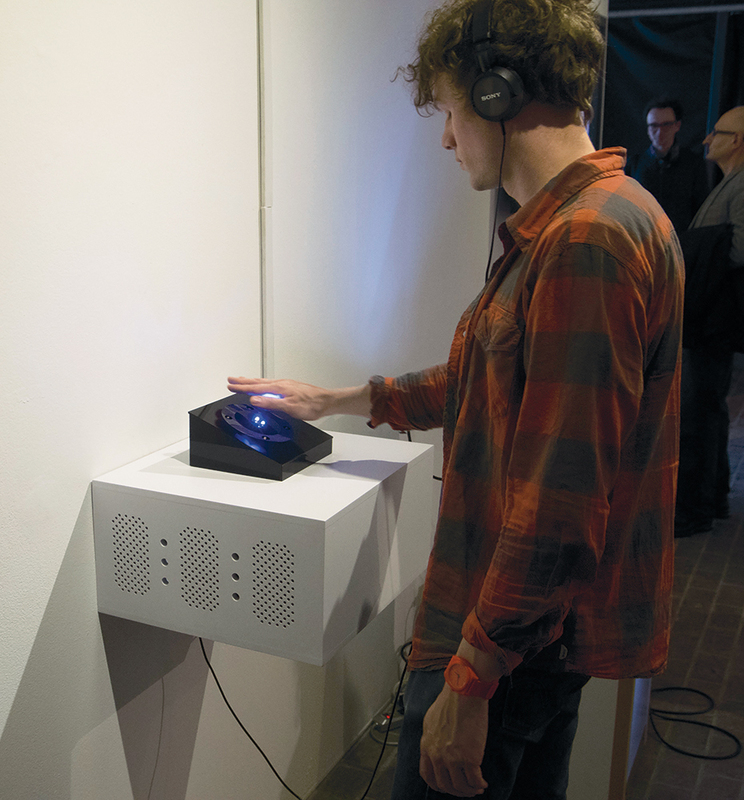 The user plays the instrument like a theremin, manipulating the frequency of four unidentifiable tones. Only through sustained interaction do the notes resolve into the familiar melodies. Non-hierarchical input On initial engagement with iHear, the user must be able to intuit a non-hierarchical - no one sensor is more important than another - interaction. Vertical gesture sound manipulation The user must be able to infer that vertical hand movement above the face of the box directly affects sound manipulation. Downward vertical motion reward The user must intuit a system where the experience climaxes as she brings her hand close to the face of the box, a climax where she discovers that the noises she’s been exploring as an abstract musical experience are actually common ringtones. To design for non-hierarchical hand movement, I borrowed from an outdated household object that relies on direct intervention with a user’s hand: the rotary phone. To allow iHear to speak directly to a single user’s hand, I mimicked the tilt of the face of the phone. I replaced the circular rotary holes with a circle of sensors, enlarged slightly to mitigate the emphasis of contact through fingertips and reference a more fluid, neutral gesture. To determine the most naturally sized circle, I asked friends (with varying hand sizes) to draw relaxed circles on paper. I collected over fifty circles and averaged their diameters to come up with the final dimensions. Interface Research. To determine the most naturally sized circle, I asked friends (with varying hand sizes) to draw relaxed circles on paper. I collected over fifty circles and averaged their diameters to come up with the final dimensions. In initial testing, the sensors and their corresponding LEDs were placed in parallel lines or half circles, echoing the shape of a relaxed handprint. However, taking from the rotary phone made for a more intuitive interaction: all sensors were represented equally, and the circle didn’t prescribe a particular type of movement. Early prototype. 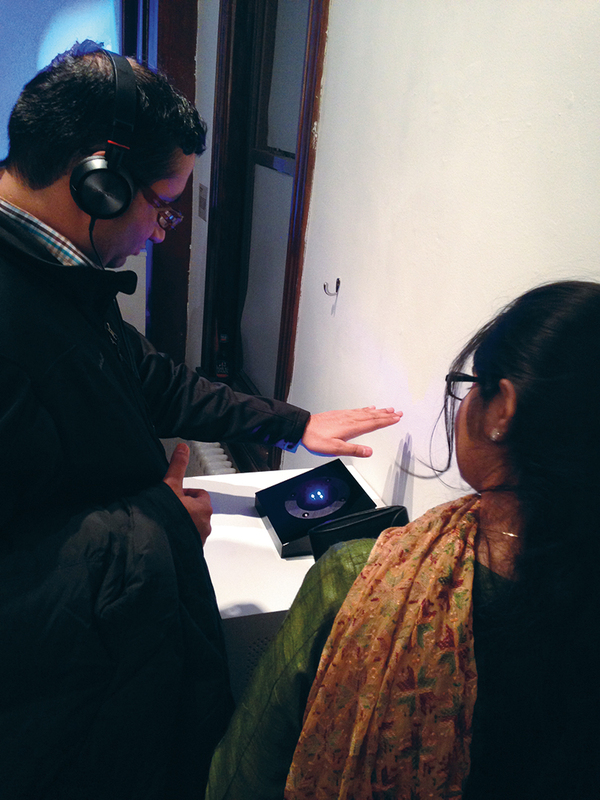 In initial testing, the sensors and their corresponding LEDs were placed in parallel lines or half circles, echoing the shape of a relaxed handprint. Later, I tilted the box toward the user, to draw him or her in - mimicking the face of a rotary phone. To sustain user interaction, I developed a system of visual feedback based on the luminosity of the LEDs. In early iterations, the LEDs indicated a simple on and off switch corresponding to their respective ringtones. After initial user testing, it appeared that users didn’t understand that they could vary the vertical distance between their hands and the photocells, which meant they were never hearing the ringtone at regular or recognizable speed. In the final iteration, LED luminosity, like ringtone frequency, is mapped to the light levels. The system of reward, through LED luminosity, indicates to users that their interaction is indeed changing the audio they are hearing, and enables them to intuit the necessary movement downward, closer to the face of the box, in order to complete the interaction. The system of reward, through LED luminosity, indicates to users that their interaction is indeed changing the audio they are hearing, and enables the user to intuit the necessary movement downward, closer to the face of the box, in order to complete the interaction. iHear asks, if we can rip the nagging cultural connotation from the beeps of our phones, and replace it with a mysterious musical experience, can we learn to harmonize with our digital infrastructure as well? Looking beyond its metaphorical ideals, the instrument confirms that we, as humans, have a powerful ability to listen and observe and find joy and beauty in the world around us. In this regard, iHear is a reminder of human authority. It acts as a prompt to empower its users - their roles of consumers and producers aside - to spend a few moments authoring joy, humor, and beauty where it is least expected.